What is the “winter school” for Germany’s New Right? 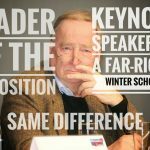 This weekend, Alexander Gauland, co-leader of the AfD, will give a lecture at the annual “winter school”, a weekend seminar that is organised by the “Institut für Staatspolitik” (IfS). The IfS is a Wannabe-Nouvelle-Droite think tank based in Schnellroda, a tiny village in Saxony-Anhalt. Its mastermind is Götz Kubitschek, a far-right publisher, author and self-styled “New Right” intellectual. Kubitschek believes in meta-politic: a conscious attempt to alter the meaning of words and establish new frames, to shift discourses and to form the minds of new generations, all in a bid to change the course of the nation. He and his associates borrowed this concept from the French Nouvelle Droite, who in turn got some ideas from the German “Konservative Revolution” of the 1920s and 1930s and mixed them, ironically, with a bit of Gramsci. Their “winter school” is a crucial part of the meta-political strategy. It is run exclusively for people under the age of 35. Students pay just 60 € for two nights, including full board and access to all lectures. If they subscribe to “Sezession”, a highbrow right-wing magazine published by Kubitschek and the IfS, this is further discounted to 40 €. Getting to Schnellroda is definitively the most costly part of the weekend. But why is Gauland going to Schnellroda as a speaker? Kubitschek lives the Altdeutsch dream. More specifically, he lives in the local manor house, together his wife Ellen Kositza (also a far-right author) and their many children, who bear traditional Germanic names. We know all this from the newspapers. Kubitschek’s elite brand of far-right politics has attracted an unhealthy interest from mainstream journalists, who are occasionally allowed to visit the couple in exchange for half-gushy, half-disgusted home stories. Scientists are similarly intrigued, and there is a lot of research (in German) about the “New Right” networks Kubitschek and his ilk form. I sometimes wonder if his influence and importance are seriously overestimated. In the past, Kubitschek’s radicalism and elitism made for an uneasy relationship with the AfD. In 2015, when the party’s transformation from soft-eurosceptic to radical right came under way, he and Kositza applied for membership. They were initially accepted, but within days, the national executive, then still controlled by Bernd Lucke, intervened and rejected their applications. 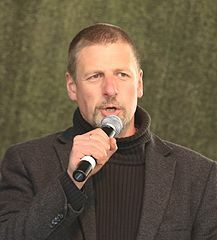 Nonetheless, Kubitschek is closely involved with the most radical Eastern circles in the party, whose members regularly attend events at Schnellroda. It was here, at an IfS meeting, that Höcke made his infamous speech about “Africans”, and it was Kubitschek who put a video of that speech online. In his characteristically cringeworthy style, Höcke has praised the manor house as a sort of spiritual home for the AfD’s hardliners. In turn, Kubitschek and Kositza have attended conferences organised by the “Flügel”, the far-right network that is now under scrutiny by the Federal Office for the Protection of the Constitution (BfV), i.e. the secret service. Kubitschek has also spoken at “Pegida” and “Legida” events. At the invitation of Matteo Salvini, he has attended a Lega conference, but he also has contacts to the neo-fascist Casa Pound and has even published a Casa-inspired book in translation. He is friends with Martin Sellner, one of the most prominent figures in the “Identitarian” movement, and works closely with Jürgen Elsässer, one of the most prominent figures of the German far-out-right. Kubitschek is no neo-Nazi – that would be far to vulgar. But he puts himself into the succession line of the “Konservative Revolution”, the young, revolutionary and above all anti-democratic movement that operated at the fringes of conservatism in the Weimar Republic and helped to pave the way for the real Nazis. What is Gauland doing at the Schnellroda “Winter School”? 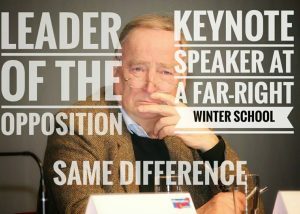 In short, the IfS’s “winter school” is a remarkable event for Gauland to attend, let alone to give a lecture. Gauland is by no means the first AfD politician to speak at Schnellroda, but as national co-leader and co-leader of the AfD’s caucus in the Bundestag, he is by far the most prominent one. Gauland has attended “Flügel” meetings in the past, and has repeatedly defended Höcke. But he is still widely seen as “bürgerlich”, because as a former high-ranking bureaucrat, CDU member and conservative journalist, he is a card-carrying member of the elite that has run this country for seven decades. In a press conference this week, the BfV announced that they would put the Flügel under enhanced scrutiny, which can even include measures such as phone tapping. When a journalist asked whether this could also affect Gauland, the BfV’s president said that would depend on what kind of information they would come unearth in the coming weeks and months. In this situation, speaking at Schnellroda is either particularly brave or extraordinarily stupid. Either way, we have reached the point where, within a single week, we have learned that the leader of the biggest opposition party in the Bundestag a) may come under observation by the secret service and b) is the headline speaker at a notorious far-right gathering. What a time to be alive.